IN the absence of my wife who was attempting to wreak as much havoc as possible to her credit card in the shortest time available, a travel-writing colleague and myself made the near-fatal decision of asking our Lisbon hotel barman where we could find a couple of local tarts – and if it would be okay to bring them back to the bar. So on enquiring of our possible whereabouts on her return, my wife was told that "Mr Ellis and Mr Andrews asked where to find tarts, and I told them to go to Belem down on the waterfront," the helpful barman told her. "The tarts there are Portugal's best." And thus on our return soon after, I was invited to 'fess up very quickly – after 46 years of marriage – as to just what we two had been up to. Fortuitously we were saved by the evidence we still carried in a box: not two, but a half dozen of Lisbon's famous Belem Tarts, sweet and more-ish little custard pastries that are considered somewhat of a Portuguese national treasure. When discussion turns to the finest of the world's more-sugary creations, Portugal seldom springs to front of mind, thus on our recent travel-writing mission there we decided that rather than do the usual round of ancient buildings, Malcolm (who writes and talks about travel on radio in Port Macquarie) and I decided to go in search instead of the tart that had put a town on the map. We found Belem itself no longer a town, having been absorbed many years ago into Lisbon's urban sprawl, and that it's Pasteis de Belem is the best-known patisserie not just here, but in the whole of Lisbon and Portugal. It seems that in days of yore, nuns used huge amounts of egg whites to, somewhat strangely, stiffen their habits, and to also remove cloudiness from monastery-made wines, leaving them with great quantities of egg yolks to find a use for. Many imaginative dishes were thought up at the Jeronimos Monastery, one being a small baked puff-pastry tart with a custard filling of crème brulee-like consistency. But the Monastery and others were closed during the liberal revolution of the 1800s, putting an end to the making of the tarts. However on also finding himself suddenly out of work, an enterprising lay baker at the monastery and who knew the tart's recipe, Domingo Rafael Alves bought a small shop nearby and began making the tarts there to considerable success amongst the locals. Today that same shop is now the Pasteis de Belem and is run by the Clarinha family who are descendants of Domingo Alves – and of these, only three know the recipe of the filling for the Belem Tart, each day meeting in a locked kitchen to make the egg custard mix. Whatever it is it's been drawing locals and tourists to the shop for nearly two centuries, with around 18,000 of the little tarts with their caramelised tops sold each day. Customers can queue for an hour or more if they want to take tarts and drinks at the patisserie with its yesteryear blue tile walls, but take-away service is quicker. And if you see tour coaches outside, do yourself a favour and have a look at the Jeronimos Monastery nearby until the mobs have gone – the beautiful old building is the resting place of many of Portugal's kings, queens and the explorer Vasco da Gama. As good scribes we tried out best to discover the secret of the Belem Tart recipe, even tracking down a waiter who has worked at the patisserie for nearly 40 years, but who pleaded total ignorance. We did learn from others, however, that the pastry and custard are made during the day and rested overnight – and then baked for 30-minutes at a furnace-like 400-degress Celsius. And while we'd expect the custard filling would comprise the usual milk, cream, egg yolks, caster sugar, plain flour, cinnamon, probably lemon peel and vanilla extract, just what the secret ingredient that sets those of Belem apart from the rest will remain just that. 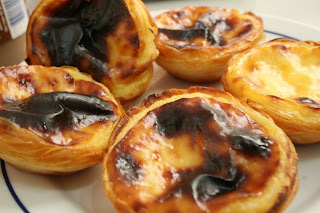 NATIONAL treasure: Lisbon's famous Belem Tarts – the caramelised top comes from being baked at a furnace-like 400C. 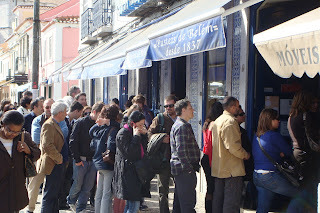 QUEUEING-up is a daily ritual outside the Pasteis de Belem that opened in 1837 and sells 18,000 Belem Tarts a day.